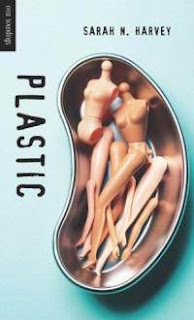 Summary (from the back of the book): When his best friend Leah decides to have plastic surgery for her sixteenth birthday, Jack is horrified--and then determined to stop her. Researching the surgery and the results, he find that there are unscrupulous surgeons operating on the very young, and no one does anything about it. Jack organizes a protest and becomes an instant celebrity. But when someone else takes up the cause, and the protest turns violent, Jack is forced to make some tough decisions. Review: This book comes from the "Reading Collection" in my school's library, which means that it is written at a lower reading level (3.2 to be precise). That sounds babyish, but Orca Soundings does a wonderful job of publishing books that are easier to read for students for whom English is a second language and students who, for whatever reason, have difficulty reading. The Orca books in our library collection are all aimed at high school students with characters and story lines that they can relate to and will find interesting. Most teenagers, well, most people, have something about themselves that they are unhappy with and that is the theme of this book: teens getting surgery to "fix" a problem they think they have. The author approached this in an effective way because her main character, a boy, is obsessed with women's breasts. He thinks about them, writes about them, looks at them, etc. His best friend, a girl, wants to get her enhanced. Because he cares about her so much he does research into teenage plastic surgery, starts a blog to get other people's personal stories, and interviews local plastic surgeons. He is so horrified by what he learns that he takes up a one-man picket in front of his friend's doctors' office. I won't tell you any more of the story, but this this book is a great story about friendship, challenging authority, thinking for oneself, learning and researching, and "fame". I really enjoyed this fast read and think teenagers will as well. I love that this book cover is the exact same as Westerfeld's Uglies (british edition). Amanda--How funny that they used the same photo on the cover of two different books! I could see how it fits for both books. Thanks for the review and for explaining the reading level and idea behind this book series. I've seen some of these books in our school library, and now can steer reluctant/ less fluent readers to these titles. I've now wishlisted this one! Thanks! for sharing this review. Mrs. DeRaps--Orca soundings are quite successful and popular at our school. I have an order in to them as I write. I've read or heard about similar themes and they always fascinate me. One is Uglies, which though not a great series definitely has a valuable message. Then there's Unwind, which I think has a similar msg so I want to check that one. I'm glad to come across this one- I think the simple language might put me off, but I'll keep that in mind!